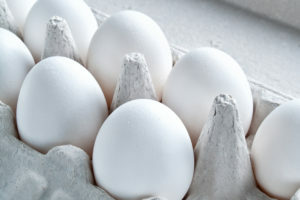 “Eggs really are the perfect food — especially local eggs that come from chickens you know,” says Kristin Kirkpatrick, MS, RD, LD. Conveniently packaged, eggs are rich in nutrients, low in calories and packed with high-quality protein. “In moderation, eggs are an affordable, easy protein source for breakfast (in veggie omelets), snacks, salads and dinner (in stir-fries),” says Anna Taylor, MS, RD, LD, CDE. Although you can eat unlimited egg whites, egg yolks are high in cholesterol. “If you have, or are at risk for, heart disease, limit yourself to two to four egg yolks per week, depending on your risk factors,” advises Julia Zumpano, RD, LD. She recommends keeping half a dozen hard-boiled eggs on hand for snacks or salads. They’ll keep in your fridge for one week. “I keep a variety of fresh veggies in my fridge at all times: broccoli, bell peppers, carrots and other basics, plus fun veggies like sugar snap peas or asparagus,” says Ms. Taylor. Think produce is expensive? “It should make up one-third of your diet, so it should take up one-third of your grocery budget,” she says. For faster prep, buy veggies prewashed and precut (or do this yourself on weekends). Add veggies to your favorite recipes, dip them in hummus, saute them or roast them. For Ms. Zumpano, it’s all about the leafy greens: They’re packed with vitamins (A, B2, B6, C, E and K, and folate) and minerals (calcium, copper, fiber, magnesium, potassium and zinc). “I keep a large container of organic spinach, arugula, mixed baby greens or spring mix in my fridge at all times to add to soups, salads, rice, pasta, smoothies and protein shakes,” she says. Love salads, but hate the prep? Buy salad kits in the produce section. “They allow you to make restaurant-quality salads in minutes,” says Hillary Sullivan, RDN, LD. Complete with crunchy toppings and dressing, just add a lean protein to your salad kit to make a meal. “Berries are low in sugar, compared to other fruits, and quite versatile,” says Ms. Zumpano. They’re rich in antioxidants, vitamins and minerals (specifically vitamin C, folate, potassium and fiber). She adds berries to cooked grains and dry whole-grain cereal, yogurt, smoothies and protein shakes. Ms. Kirkpatrick is partial to blueberries. “I always have them on hand. You can take a handful for a quick snack, and blueberries are an easy add-on for oatmeal and salads,” she says. Plain, non-fat or low-fat Greek yogurt is a good source of probiotics and protein. Top yogurt with fresh or frozen fruit (and cinnamon) for breakfast or snacks. “Or use 2% reduced-fat plain Greek yogurt to add instant tang, like sour cream or cream cheese would, to any meal,” says Ms. Sullivan. Cooked chicken breast. Grilled turkey burgers. Beans. Quinoa. “These ready-to-eat lean proteins make prepping dinner quick and easy at the end of a long day,” says Ms. Sullivan. Ms. Kirkpatrick would add tempeh to that list. She uses it in a variety of meals and snacks. So put these items on your grocery list, and keep your fridge well-stocked with them. You’ll find yourself enjoying healthy, amazing meals all week long.